Buses, culture and book launches at ALIGHT! 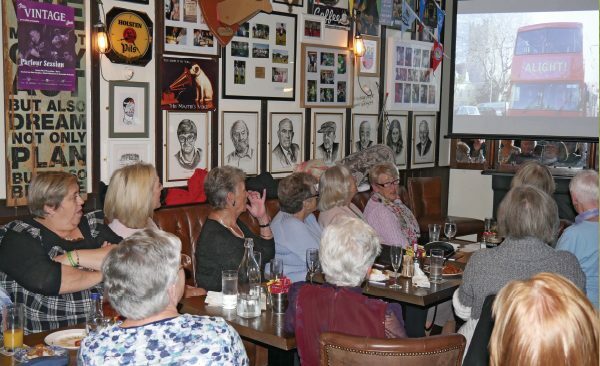 Participants from groups including Ringsend Active Retirement Group, The GALS, Betty Watson Group, Greenore Community Choir and the Dazzlets were at the Vintage Inn for the ALIGHT! Book Launch. We have covered the ALIGHT! Project a lot here at NewsFour, it feels like we have been with them every step of the way. On a Thursday evening on September 14th participants and collaborators of the storytelling, dance and performance art project met to celebrate all the amazing work they had done with a book launch. The Vintage Inn was packed with members of the local community who had come together during four weeks in January to hop on a big orange bus that connected them, quite literally, to their culture and creativity. Every dance workshop, day out and mystery history cabaret was paid tribute to in a beautifully illustrated book that you can cherish and use to reminisce on all the memories and friendships made. All of this thanks to Dublin Culture Connects in collaboration with Coiscéim Broadreach and the National Neighbourhood. To finish off the book launch, Jitterbug Jackson, clowned around by juggling knives, sang and danced. Kathy Gleeson led a sing-a-long of The Auld Triangle and another community member, Anthony, helped get the crowd going by singing Take Her Up To Monto and I still cannot get the tune out of my head!